In large sauté pan over medium heat, sauté onion in olive oil until soft and translucent. Add spices and salt; cook until very fragrant, about 30 seconds. Add chicken and stock; bring to a boil. Reduce heat, cover, and simmer until thighs are tender, about 1 ½ hours. Discard cinnamon stick and set aside to cool. When cool enough to handle, shred chicken by hand. Cut phyllo dough into 6”x6” squares. Brush one phyllo square with melted butter and lightly dust with ground cinnamon. Top with another square of phyllo and repeat process with more butter and a touch of cinnamon. 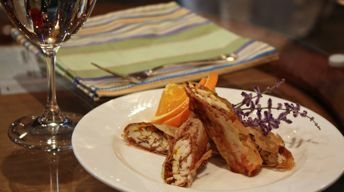 Place about 1 ½ Tbsp chicken mixture along one edge of phyllo; roll up like a cigar and place on a parchment-lined sheet pan. Brush with butter. Repeat process until ingredients are used up. Bake in 400°F oven until golden brown and crisp, about 8-12 minutes. Serve warm.